A teacher who helped write the controversial Obama-heralded ‘Common Core State Standards’ reveals the real motivation is based on ending “White privilege” and are not really “educational standards” at all, but a means to subjugate States’ rights to Federal administration. 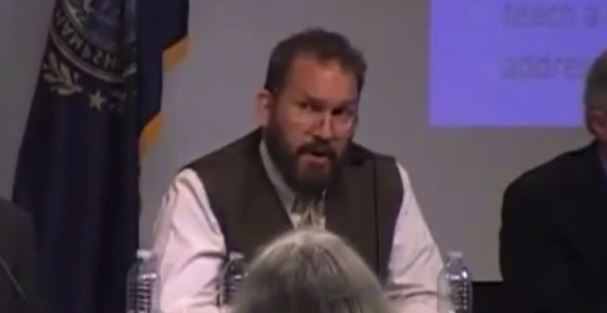 Dr. David Pook, a professor at Granite State College and chair of the history department at the Derryfield School in Manchester, New Hampshire, had just been introduced at the event at New Hampshire Institute of Politics on Monday night when he delved into his ties to Common Core. In the video first posted by Campus Reform, the audience can be heard gasping and laughing, stunned and revolted by the comment that exposed the disturbing, left-wing racial motivations of ‘Common Core’ propaganda. Pook went on to say all kids deserve an “equal opportunity to learn how to read” and the same advantages he had. Ironically, as Campus Reform failed to annotate, the Derryfield School where Pook works does not use the Common Core State Standards and has a student body that is 91 percent white. It is also ironic since the “standards” have been especially hard on Black and Hispanic students, who have seen their test scores plummet since the introduction of Common Core. But perhaps that is all worth it to Pook, to achieve Common Core’s distortion of American history to portray Whites as evil and privileged, and minorities as victimized by them. If your objective is not education, but indoctrination, Common Core fits the bill. Michelle Malkin, Glenn Beck and many others have written extensively about the abject disaster that is Common Core, and as Americans have been exposed to examples of its instruction, and motivations of its backers, they have increasingly rejected it. Surely this revelation is cause to reverse the implementation of Common Core and all the damage it is destined to inflict? Dr. David Pook, a professor at Granite State College and co-writer of Common Core standards reveals racist motivation and intent.